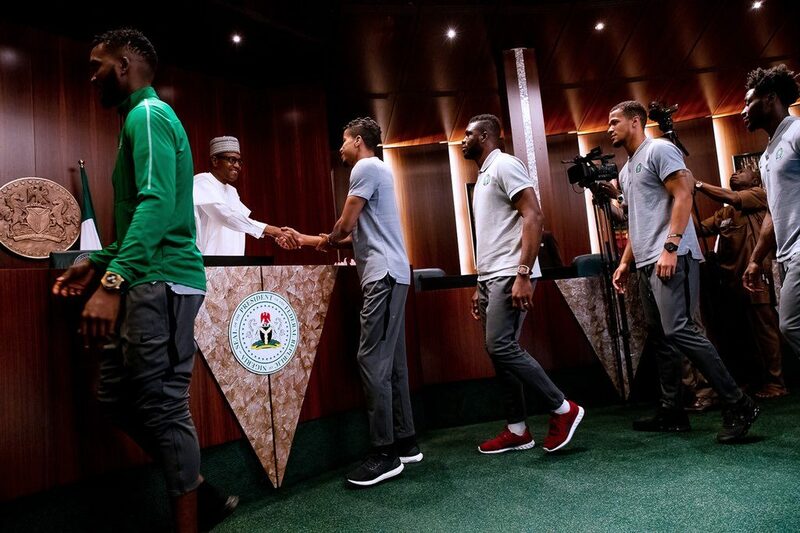 President Muhammadu Buhari on Wednesday told members of the national team, Super Eagles, that only victory at the forthcoming World Cup in Russia will gladden Nigerians. While urging them to embrace fair play, the President also urged the players to demonstrate, at the tournament, the gallant spirit which Nigerians are known for. Buhari spoke during a reception organised for the team at the Presidential Villa, Abuja. He asked them to always remember that they are carrying the passions, emotions, and feelings of over 180 million people. Buhari observed that the team appeared to be the youngest in the competition and urged them to utilise that factor to their advantage. The President said, “As you are going to represent us in Russia, you must bear in mind that you are not just going for a tournament. “With each game, you must remember that you are carrying the passions, emotions, and feelings of over 180 million people. “Play fair and clean, but demonstrate the gallant spirit which Nigerians are known for. “Nothing unites Nigerians more than football and nothing will gladden the people of Nigeria than for your to acquit yourself honourably by winning in Russia. “You are the youngest team in the tournament which means you are likely the most inexperienced team, a fact that will not be lost on your opponents. But it is also something that you can use to your advantage. 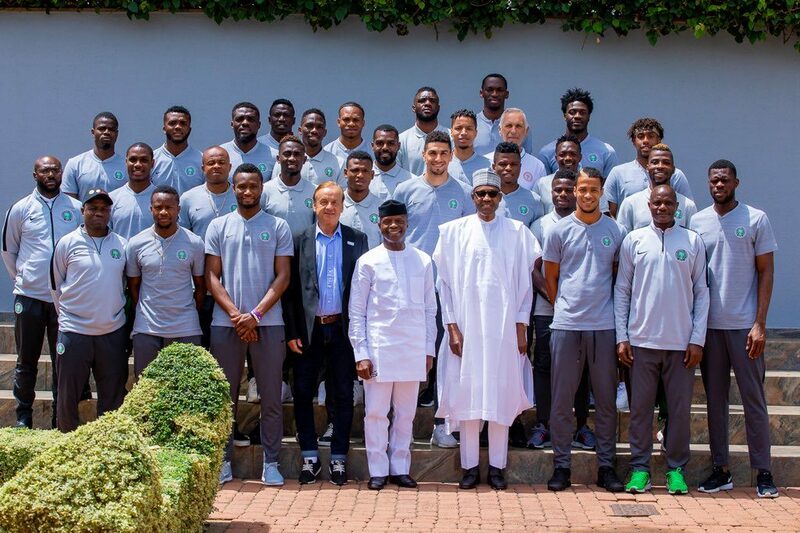 Buhari commended the Nigerian Football Federation for drawing up the right programme that is helping to refine the team to the powerful force which it’s meant to be. “This is our time. We look up to you to make us proud. All Nigerians join me in saying to you, best of luck. Thank you and God be with you all,” he said. The Minister of Sports and Youths Development, Solomon Dalung, said the players would be participating in the tournament with full consciousness of the glorious outing of their predecessors. Dalung said the current crop of players started on a positive note by qualifying in style for Russia 2018. The minister who admitted that the team has been drawn in a difficult group alongside Argentina, Croatia and Ireland. He said, “It is difficult but by no means a mission impossible. The team and the technical crew are in high spirit and are highly motivated to soar above their opponents at the World Cup. “You carry with you the hopes of over 180 million Nigerians who want to see you equal if not surpass our previous best outing at then the tournament. However, this can only be possible if you put Nigeria first and seek for collective glory and not individual glory at the tournament. That is the secret of teamwork. “If you adhere to this principle, I then say the sky is your limit as well as we know that the sky is not only the playground of eagles but their natural area of dominance. The NFF President, Amaju Pinnick, thanked the Federal Government and private concerns that have been supportive, saying the NFF will be 100 percent self-ustaining in the next two years. Pinnick said one of such companies has been committing N1.2 bn annually to the funding of specific activities.